When Americans think of wine, they think of sommeliers and expensive dinners. When Italians think of wine, we think of lunch. And that’s probably why life moves just a bit slower in Europe! Jokes aside, there is a part of the European way of understanding wine that we want to bring to the States and our clientele at Due’ because we think it’s an important part to enjoying our authentic food. We’re introducing some changes to our wine list that we hope open the door up to enjoying and pairing wine with our food in a new way that matches your mood and occasion. 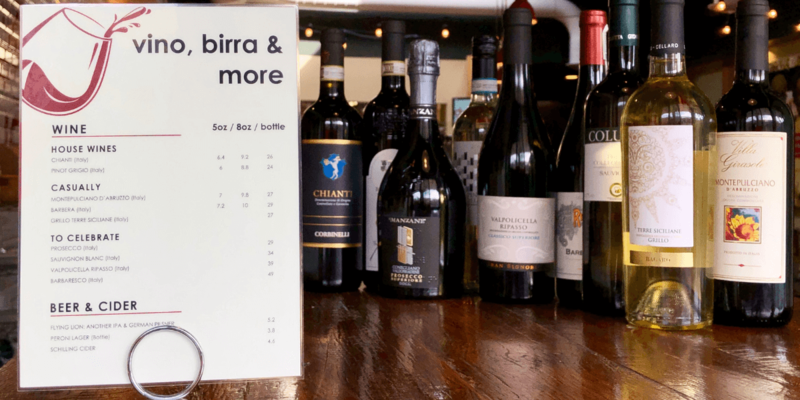 Our new wine list features a range of amazing Italian wines all organized by occasion, to help you make the right selection for both your taste and budget. We’ve increased the number of options across the board from affordable house wines for a quick lunch bite, to mid-tier wines, to more upscale options for special date nights or celebrations. There’s something for everyone and every event. Our Italian house wines are perfect for a quick pick to go with a quick meal if you’re looking for something easy and budget-friendly. We have both a white and red option to meet both styles. Our house red is Chianti from our home of Tuscany. It’s dry with medium-to-full body and moderate tannins. Our white house option is a Pinot Grigio from the Veneto region of Italy. It’s light bodied, dry and crisp. Both a perfect pairings for a quick lunch. If you’re entertaining guests or treating yourself out for a nice lunch or dinner, we’ve created this “Casually” section to help your find the right selection. They’re a tab more expensive that the house wines but still in a nice budget range for a nice lunch or informal dinner. We’ve added a few new wines here to pick from that you’ll love with your meal: look for the Barbera and Montepulciano D’Abruzzo. The Barbera is an Italian red from the Piedmont region. It’s a dry wine, medium-bodied, with earthy, berry flavors. Montepulciano D’Abruzzo is another Italian red from the Abruzzo region in the south. It’s dry as well, medium-bodied, with red fruit notes. Both are excellent choices for a casual meal. Our “To Celebrate” assortment is for those special events you really want something special for: birthdays, anniversaries, entertaining business meetings, etc. This selection is a bit pricier but the Italian wines are excellent and are a perfect companion to our dishes if you’re looking for an experience that really stands out. These are served bottle only and meant to share with your party (or not!). We’ve really beefed up this menu with three new fine Italian wines to choose from: a Sauvignon Blanc, Valpolicella Ripasso, and Barbaresco. The Sauvignon Blanc is a white from the Friuli region of Italy. It’s dry with earthy flavors. The Valpolicella Ripasso is a red from the Veneto region of Italy. It has medium body and has earthy, tart berry, and herbal notes. Our most expensive option for a real treat is the Barbaresco, a red addition from the Piedmont region of Italy. It’s dry, full-bodied, has red fruit notes with a firm tannic structure. Regardless of the occasion and where your budget is for it, be assured we have an amazing imported wine option for you that matches the authenticity and quality of our Italian food. We hope you enjoy exploring our new wine menu! Quintessential Tuscany. Dry, medium to full body, moderate tannins. From the Veneto region, Light-bodied, dry and crisp. From the Abruzzo region. Medium-body, dry with red fruit notes. From Piedmont region. Dry, medium-bodied, with earthy berry flavors. From the Sicily region. Fruity, sweet with moderate acidity. From the Veneto region. Medium-body, dry with red fruit notes. From the Friuli region. Dry, with earthy flavors. From the Veneto region. Medium body, earthy, tart berries and herbs. Dry, full-bodied, red fruits with firm tannic structure.